The mother of all Kustom Kulture books, is back in print! Our massive, 420-page, 5-color, coffee-table-bustin’, comprehensive catalog of the multi-faceted artist Kenneth “Von Dutch” Howard is packed with over 1,000 photos and illustrations, 15 essays, lots of great stories, and a detailed timeline documenting his life. Over 3 ½ years in the making, this treasure-trove is a must-have for anyone interested in the versatile craftsman known for his innovative pin-striping, engraving, machining, sign painting, fine art, and mechanical skills. Compiled by Aaron Kahan, Douglas Nason, Al Quattrocchi and Jeff Smith. Designed and published by Tornado Design, Los Angeles. For orders to Hawaii and Alaska, please call us for a shipping quote. Sorry international or rush orders not available at this time. George Barris, Bird Betts, Peggy Betts, Stan Betz, Earle Bruce, Kent Fuller, Virginia Howard Reyes, Dean Jeffries, Gwenn Jennings, Temma Kramer, John LaBelle, Norton Leeds, Ruth Levy Raymond, Mike Parti, Tom Pollard, Ed Roth, Mike Salisbury, Andy Southard, Jr., Thom Taylor, Sheila Von Dutch, Von Franco, Robert Williams and many more! $75 SOLD OUT – THANK YOU! 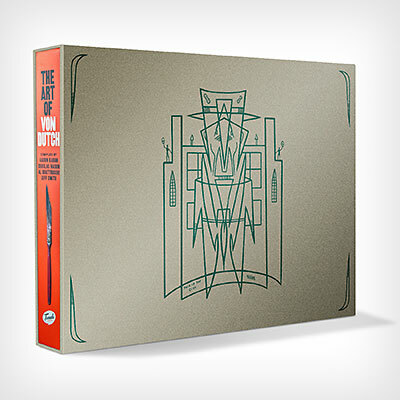 • Kustom Slipcase adorned with a classic reproduction of Von Dutch’s pinstriping masterpiece titled This Is The City, from the 51’ Hirohata Merc’ dashboard. Foil stamped on pearlescent stock. • Kustom screenprinted short sleeve cotton T-shirt with a classic reproduction of Von Dutch’s pinstriping masterpiece titled This Is The City, from the 51’ Hirohata Merc’ dashboard. • Old School water decal with classic original Von Dutch design. 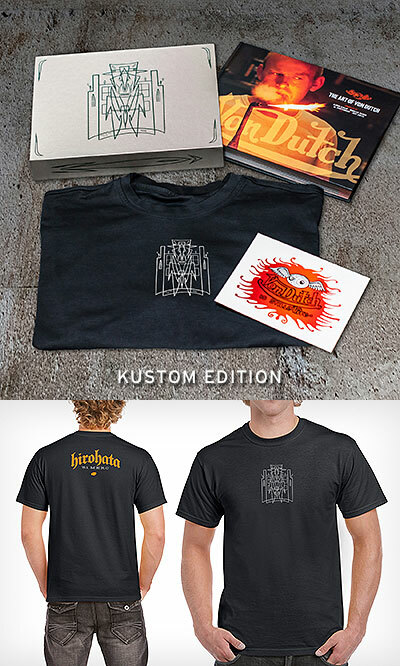 Note: Kustom Editions will be available for a limited time only, on a first come, first serve basis. Shirt to be shipped separately – please allow 2-3 weeks for shirt delivery. 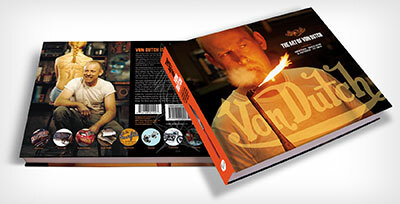 If there is one book that goes down as the historical record of the life of Dutch and his work, The Art of Von Dutch will be it...You simply couldn’t dream of more comprehensive coverage. The content here alone is worth the price of admission ($75), but the folks at Tornado didn’t stop there. I don’t know that I have ever seen a book in this industry that is so artfully, thoughtfully, and creatively laid out. Just from a design perspective, this book is brilliantly done and that is pretty hard to pull off when the primary subject is art itself. It’s art covering art. What can I say? I just got through a quick look at your book. The content, style, layout and design are perfect. Later on today I'm going to get into a page by page read. This was and is, such a piece of my life. Growing up in Southern California in the '50s and '60s gave birth to new and different lifestyles, as well as exposure to great street and fine art. I was really lucky to have been born and raised here. College was my discipline. Von Dutch, AKA Kenny Howard, was my Guru. Thanks for the re-awaking. Point is, you really do need this book for the collection. It’s arguably the most ‘no stone unturned’ work to date on Howard and we’re proud to bring it to you on these pages. A man worth knowing and whom all can now know, at least a bit, through the pages of this book which is well worth every penny of the price. There have been several books – and rumor has it there’s another coming – on eccentric custom artist and legendary pin-striper Kenneth Howard, better known as Von Dutch, but now this magnificent and much-awaited work is out no one else need bother. The team from Tornado Design has done a staggering job tracking down Howard’s associates, and collecting pictures of the many aspects of his art form weirdo sculptures to his passion for classic 'bike restoration. The Dutch book is a phenomenal effort and truly amazing.